Embodiments of the present invention are directed to compositions and methods for the treatment of purpura. 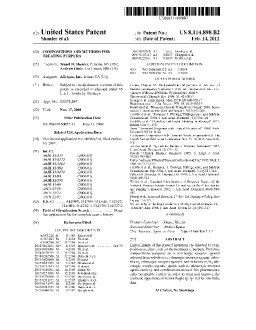 Preferred compositions comprise an α adrenergic receptor agonist selected from selective α1 adrenergic receptor agonist, selective α2 adrenergic receptor agonist, non-selective α1/α2 adrenergic receptor agonist, agents with α2 adrenergic receptor agonist activity and combinations thereof, in a pharmaceutically acceptable carrier in order to treat and improve the cosmetic appearance of hemorrhagic (purpuric) lesions in the skin. A method for treating non-thrombocytopenic purpura in a subject comprising administering a therapeutically effective amount of an α adrenergic receptor agonist selected from a selective α1 adrenergic receptor agonist, a selective α2 adrenergic receptor agonist and combinations thereof. The method of claim 1, wherein the α adrenergic receptor agonist is topically applied to the skin of the subject. The method of claim 1, wherein the α adrenergic receptor agonist is locally delivered to the subject. 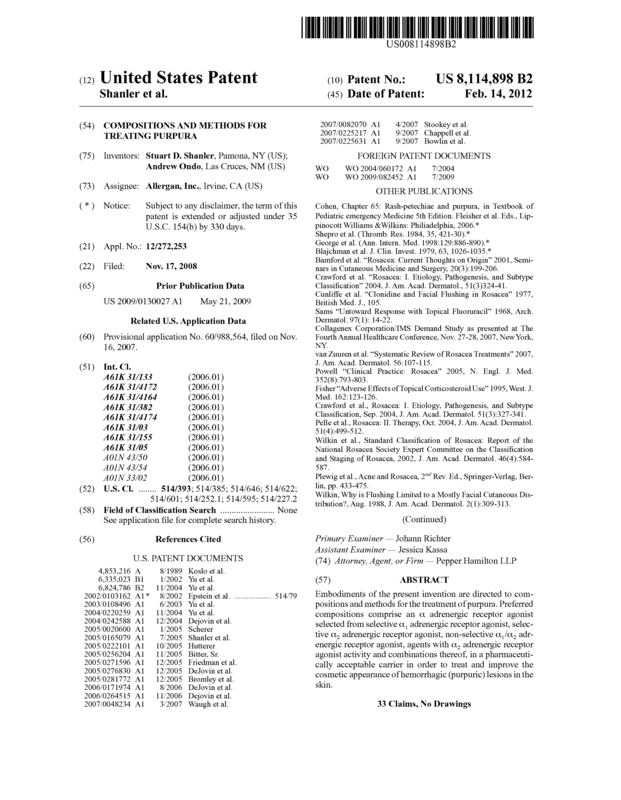 The method of claim 1, wherein the selective α1 adrenergic receptor agonist is selected from oxymetazoline, naphazoline, tetrahydrozoline, phenylephrine, xylometazoline, methoxamine, metaraminol, midodrine, desglymidodrine, cirazoline, amidephrine and combinations thereof. The method of claim 1, wherein the selective α1-adrenergic receptor agonist is selected from oxymetazoline, naphazoline, tetrahydrozoline, phenylephrine hydrochloride and combinations thereof. The method of claim 1, wherein the selective α2 adrenergic receptor agonist is selected from brimonidine, clonidine, guanfacine, guanabenz, apraclonidine, xylazine, medetomidine, dexmedetomidine, α-methyldopa, and combinations thereof. The method of claim 1, wherein the selective α2-adrenergic receptor agonist is brimonidine. The method of claim 1 further comprising administering a therapeutically effective amount of at least one other active agent selected from antibacterial agents, antiparasitic agents, antifungal agents, anti-inflammatory agents, antihistamines, anti-pruriginous agents, anesthetics, antiviral agents, keratolytic agents, anti free-radical agents, antioxidants, vitamin K, vitamin E, vitamin C, vitamin A, superoxide dismutase derivatives of plants, sesquiterpene lactones, antiseborrheic agents, antidandruff agents, antiacne agents, sunscreens and sun blocking agents, and active agents which modify at least one of cutaneous differentiation, proliferation, and pigmentation, including but not limited to tretinoin, retinol, retinal, alpha hydroxyl acids, beta hydroxyl acids and combinations thereof. 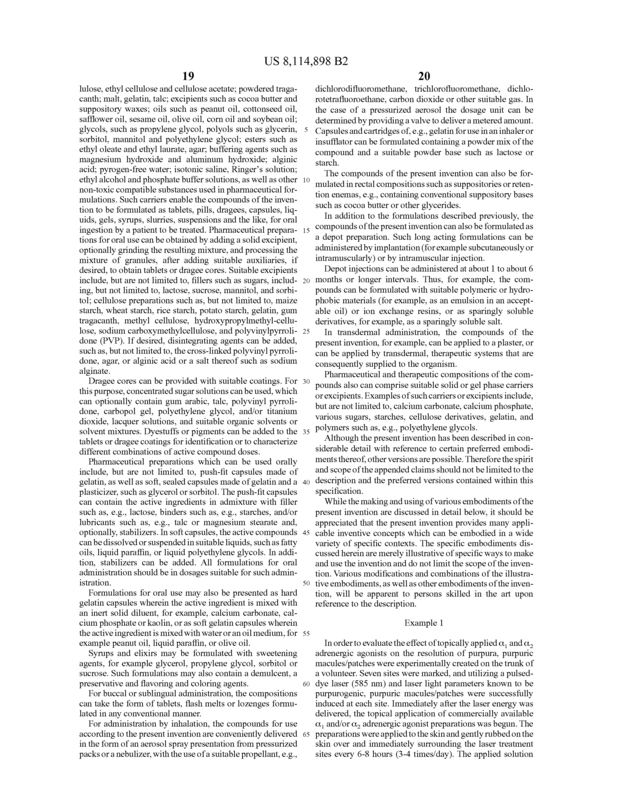 The method of claim 1, wherein said α adrenergic receptor agonist is administered in a pharmacologically acceptable form selected from solutions, gels, lotions creams, ointments, foams, emulsions, microemulsions, milks, serums, aerosols, sprays, dispersions, microcapsules, vesicles and microparticles thereof, soaps, and cleansing bars. A method for decreasing non-thrombocytopenic purpura in a subject comprising administering a therapeutically effective amount of an α adrenergic receptor agonist selected from a selective α1 adrenergic receptor agonist, a selective α2 adrenergic receptor agonist and combinations thereof. The method of claim 10, wherein the α adrenergic receptor agonist is topically applied to the skin of the subject. The method of claim 10, wherein the α adrenergic receptor agonist is locally delivered to the subject. 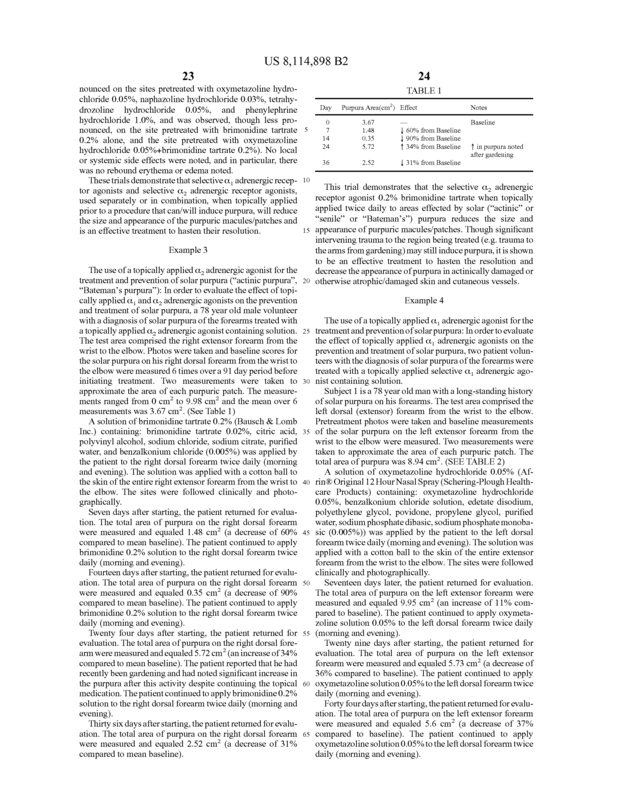 The method of claim 10, wherein the selective α1 adrenergic receptor agonist is selected from oxymetazoline, naphazoline, tetrahydrozoline, phenylephrine, xylometazoline, methoxamine, metaraminol, midodrine, desglymidodrine, cirazoline, amidephrine and combinations thereof. 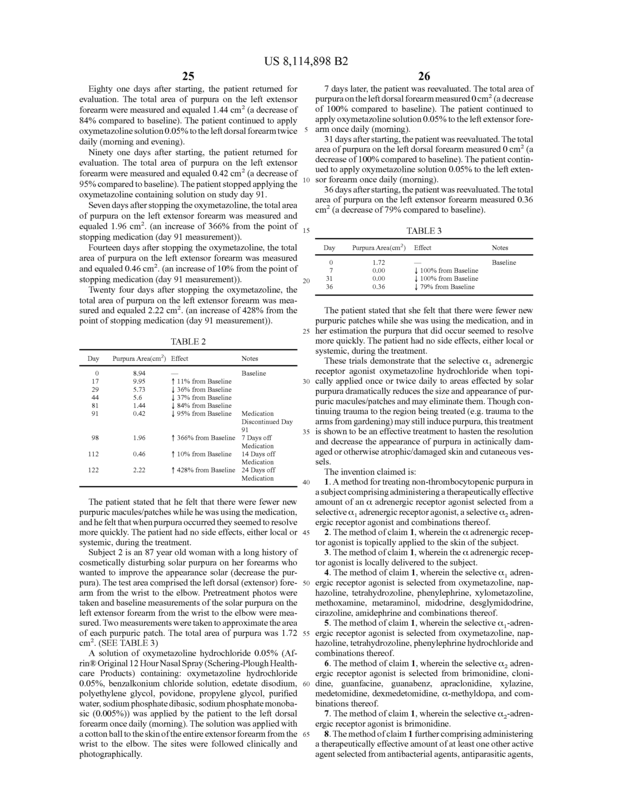 The method of claim 10, wherein the selective α1-adrenergic receptor agonist is selected from oxymetazoline, naphazoline, tetrahydrozoline, phenylephrine hydrochloride and combinations thereof. The method of claim 10, wherein the selective α2 adrenergic receptor agonist is selected from brimonidine, clonidine, guanfacine, guanabenz, apraclonidine, xylazine, medetomidine, dexmedetomidine, α-methyldopa, and combinations thereof. The method of claim 10, wherein the selective α2-adrenergic receptor agonist is brimonidine. The method of claim 10 further comprising administering a therapeutically effective amount of at least one other active agent selected from antibacterial agents, antiparasitic agents, antifungal agents, anti-inflammatory agents, antihistamines, anti-pruriginous agents, anesthetics, antiviral agents, keratolytic agents, anti free-radical agents, antioxidants, vitamin K, vitamin E, vitamin C, vitamin A, superoxide dismutase derivatives of plants, sesquiterpene lactones, antiseborrheic agents, antidandruff agents, antiacne agents, sunscreens and sun blocking agents, and active agents which modify at least one of cutaneous differentiation, proliferation, and pigmentation, including but not limited to tretinoin, retinol, retinal, alpha hydroxyl acids, beta hydroxyl acids and combinations thereof. 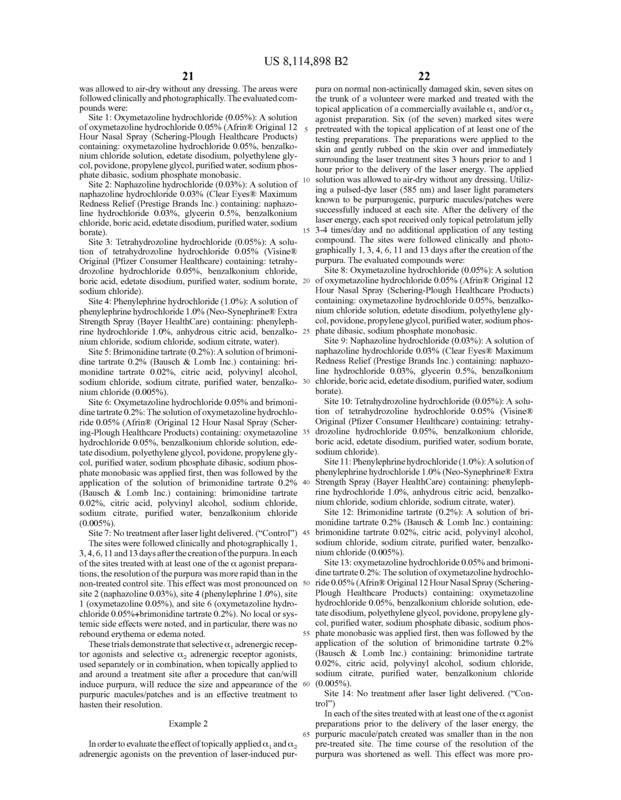 The method of claim 10, wherein said α adrenergic receptor agonist is administered in a pharmacologically acceptable form selected from solutions, gels, lotions creams, ointments, foams, emulsions, microemulsions, milks, serums, aerosols, sprays, dispersions, microcapsules, vesicles and microparticles thereof, soaps, and cleansing bars. A method for decreasing purpura in a subject from a surgical procedure comprising administering a therapeutically effective amount of an α adrenergic receptor agonist selected from a selective α1 adrenergic receptor agonist, a selective α2 adrenergic receptor agonist and combinations thereof to the site of said surgical procedure. The method of claim 19, wherein the α adrenergic receptor agonist is topically applied to said site of said surgical procedure. The method of claim 19, wherein the α adrenergic receptor agonist is locally delivered to the site of said surgical procedure. 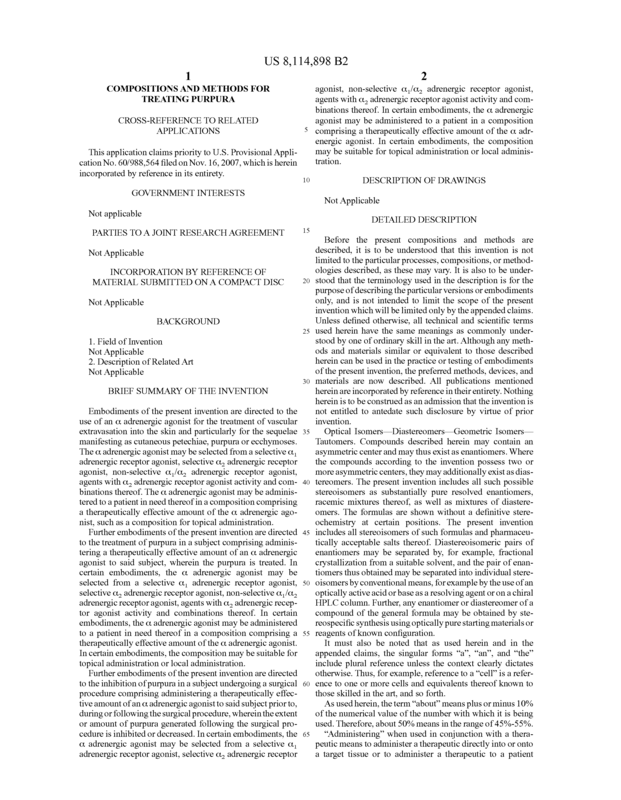 The method of claim 19, wherein the selective α1 adrenergic receptor agonist is selected from oxymetazoline, naphazoline, tetrahydrozoline, phenylephrine, xylometazoline, methoxamine, metaraminol, midodrine, desglymidodrine, cirazoline, amidephrine and combinations thereof. 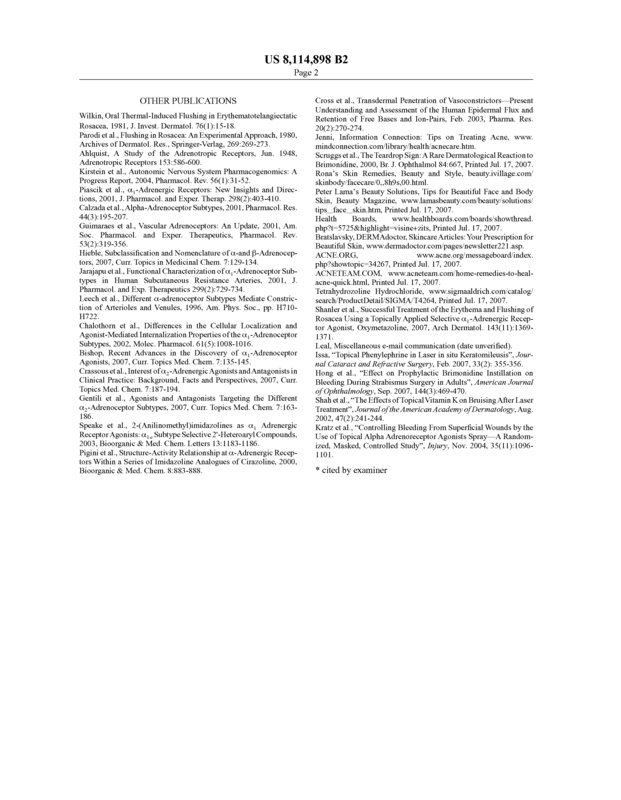 The method of claim 19, wherein the selective α1-adrenergic receptor agonist is selected from oxymetazoline, naphazoline, tetrahydrozoline, phenylephrine hydrochloride and combinations thereof. 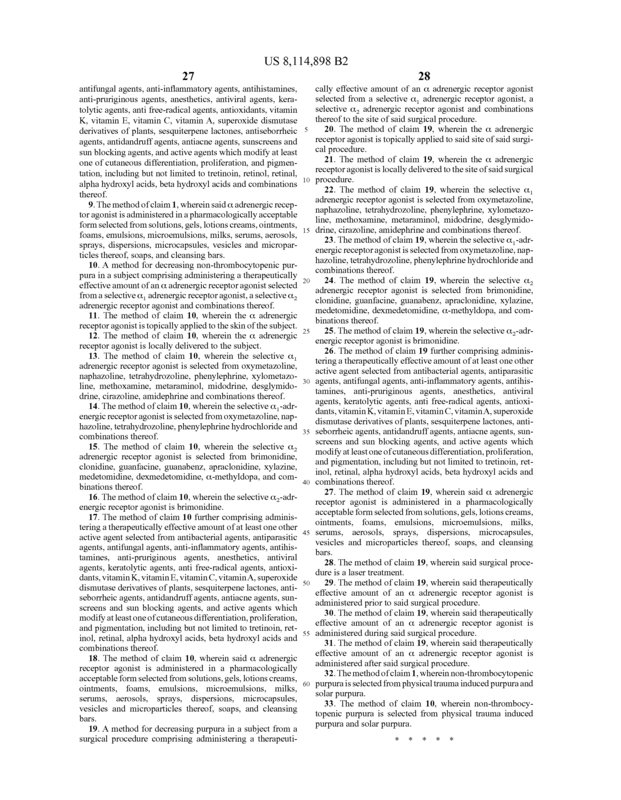 The method of claim 19, wherein the selective α2 adrenergic receptor agonist is selected from brimonidine, clonidine, guanfacine, guanabenz, apraclonidine, xylazine, medetomidine, dexmedetomidine, α-methyldopa, and combinations thereof. The method of claim 19, wherein the selective α2-adrenergic receptor agonist is brimonidine. The method of claim 19 further comprising administering a therapeutically effective amount of at least one other active agent selected from antibacterial agents, antiparasitic agents, antifungal agents, anti-inflammatory agents, antihistamines, anti-pruriginous agents, anesthetics, antiviral agents, keratolytic agents, anti free-radical agents, antioxidants, vitamin K, vitamin E, vitamin C, vitamin A, superoxide dismutase derivatives of plants, sesquiterpene lactones, antiseborrheic agents, antidandruff agents, antiacne agents, sunscreens and sun blocking agents, and active agents which modify at least one of cutaneous differentiation, proliferation, and pigmentation, including but not limited to tretinoin, retinol, retinal, alpha hydroxyl acids, beta hydroxyl acids and combinations thereof. 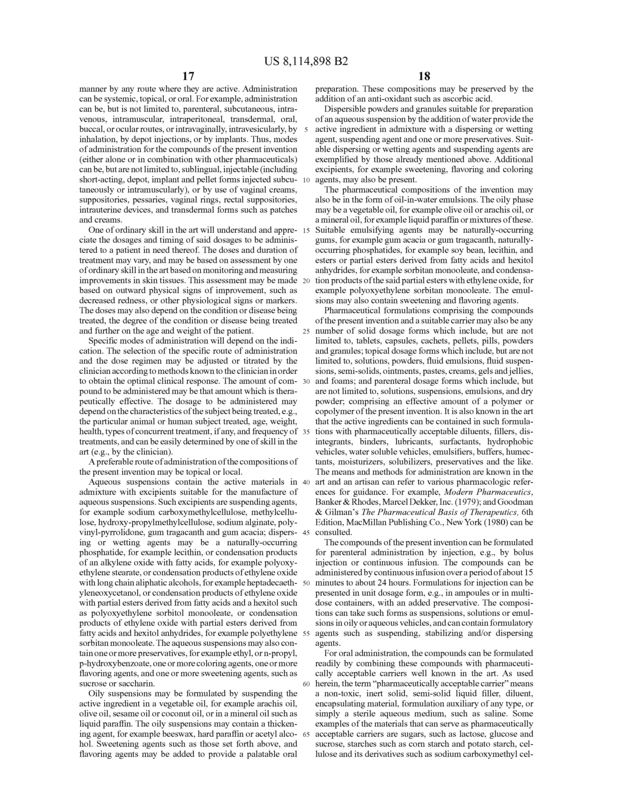 The method of claim 19, wherein said α adrenergic receptor agonist is administered in a pharmacologically acceptable form selected from solutions, gels, lotions creams, ointments, foams, emulsions, microemulsions, milks, serums, aerosols, sprays, dispersions, microcapsules, vesicles and microparticles thereof, soaps, and cleansing bars. The method of claim 19, wherein said surgical procedure is a laser treatment. The method of claim 19, wherein said therapeutically effective amount of an α adrenergic receptor agonist is administered prior to said surgical procedure. 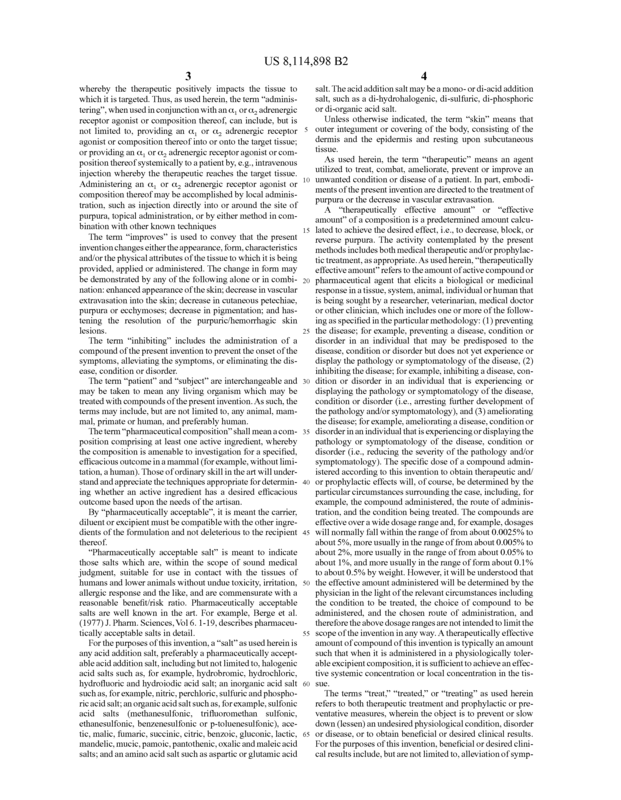 The method of claim 19, wherein said therapeutically effective amount of an α adrenergic receptor agonist is administered during said surgical procedure. The method of claim 19, wherein said therapeutically effective amount of an α adrenergic receptor agonist is administered after said surgical procedure. The method of claim 1, wherein non-thrombocytopenic purpura is selected from physical trauma induced purpura and solar purpura. The method of claim 10, wherein non-thrombocytopenic purpura is selected from physical trauma induced purpura and solar purpura.